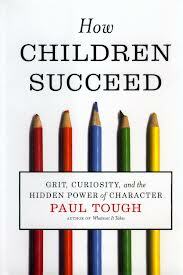 How Children Succeed: Grit, Curiosity, and the Hidden Power of Character was written by Paul Tough and a bit of a slow read at times, but which also contains some very interesting stories and information. As part of his examination into what brings about success for children, Tough breaks the book up into the following sections: How to fail (and how not to), How to build character, How to think, How to succeed and A better path. How to fail covers a number of compelling ideas with many around early childhood development and how success in school and beyond often predicated on what happens prior to starting. The impact of how many words a child hears from their parents early in life is noted along with the the import of a parent's nurturing and soothing a baby during the many situations of stress early in life (with this frequently described as "attachment parenting"). Following up on this idea of stress and it's potential negative impact was a significant amount of material from Tough on how childhood mental trauma often results in health problems later in life. He notes how this occurs because of the negative health effects of mental stress as triggered through the body's HPA axis system that manages our reaction to situations of stress. They're two slightly different flavors of stress management, but examples would be the stresses of living in poverty and of being in dangerous situations. What comes into play in this second scenario is the physiological fight or flight response where adrenaline builds up as our instinct is to avoid harm. While the adrenaline can be a good thing in helping deal with the immediate danger, it can also have a negative effect on the body if a common thing. It's a bit of a simple statement, but a definite point that could be taken from How to fail is that it's not just on the schools to teach children as their home environment has a big impact. The How to build character chapter dealt heavily with the subtitle of the book, Grit, Curiosity, and the Hidden Power of Character. The idea from Tough is that pure intelligence (as measured via I.Q.) often not as important as character traits or non-cognitive skills. He cites how important finishing high school is to success later, but not necessarily for knowledge learned there, rather for an example of how someone has the traits needed to follow-through. The basic idea is the value that can be derived from persisting at anything that can be at times boring and feel unrewarding. They may all be just alternate for what Tough includes in his book subtitle, but some other important traits he notes are self-regulation, persistence, conscientiousness, self-confidence and optimism... with Tough's writing on the last of these making reference to the book Learned Optimism by Martin Seligman. The latter parts of How to Succeed felt to bog down a bit for me, but there continued to be some interesting material including the chapter How to think that dealt heavily with children devoting time and energy to the game of chess. Featured was Elizabeth Spiegel, the chess coach at IS 318, a public middle school in Brooklyn. All in all, Tough wrote an excellent book for anyone wanting to read about the topic of children and their paths to success. Additionally insight can also be found from the New York Times book review by Annie Murphy Paul.